I decided to write this post on the train from Minneapolis to St. Cloud. While looking at the accurate and geometrically precise shapes of the farms, cornfields and American houses, I was reminded of the painting by the famous American artist Grant Wood, “American Gothic”. We can consider the paining as one the masterpieces of American art. The father of the family and his daughter are standing with a pitchfork against a background of a gothic style window. Their expression is rigorous and weak-willed. The first time I saw the picture I was in high school, while taking a class on Art History; the composition reminded me of childhood during the fall break time in Georgian mountains – being punished by my parent with the obligation of helping my neighbors while the harvest period. America for many people starts from the Central Park and ends at the Walk of Fame; sometimes Georgians consider the U.S. as either a depraved castle or factory making dreams come true. But while being on the railway towards St. Cloud you realize that the Midwest type of the life and culture of rural areas are exactly as portrayed by Grant Wood. 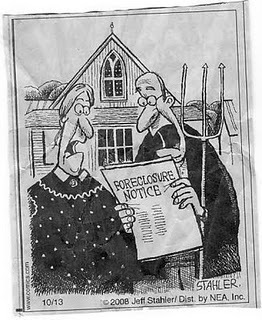 Wood has painted American Gothic in 1930, when he noticed the house with the gothic style windows in Iowa, where he was born. “The kind of people I fancied should live in that house.”- he replied. 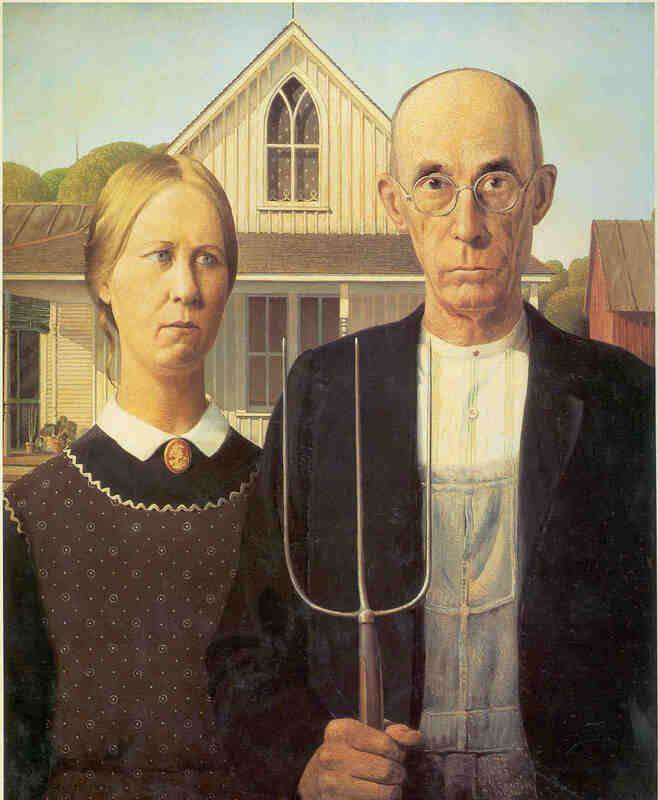 Later on Grant Wood denied the idea that the picture was the satire of Midwestern idea of life. But to my mind the painting is showing the stereotypical customs of the Midwest culture – painting is the mixture of the traditional values, an apparent “Scandinavian” cold look and hard work. What does Midwest look like? From the Minnesotan experience I can provide some characteristics and principles of the culture; first would be religion – you can see many families going to the Sunday morning service, various churches are involved in civil work; churches are also way for socializing and making friends. The next is family – I know few here in Minnesota who aren’t complaining about being “far” from their families, “far” meaning 1 hour drive from St. 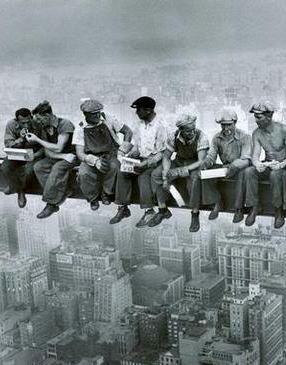 Cloud; Family comes first, then it is followed by the work, friends, university, etc. ; and the last are the corn fields and farms that everybody will notice on the way to the city, though the university gives more life to surrounding, makes it more dynamic and modern. Also I should admit that Minnesota residents do smile a lot and are not that much strict looking as Wood has viewed. 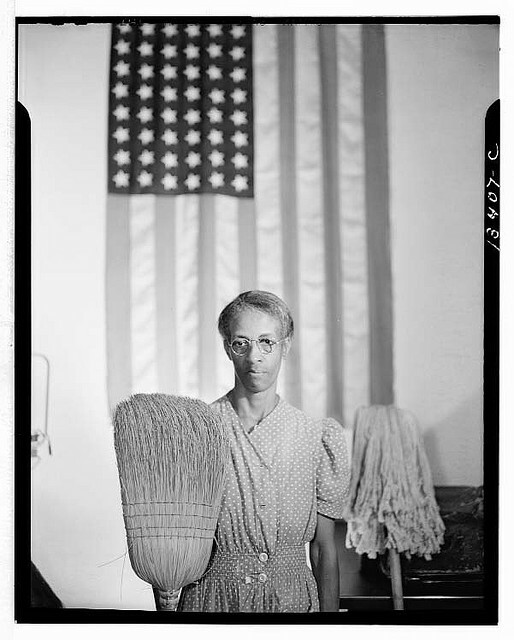 Wood’s painting had a lot of resonance; many people created their own versions of it; including the photo of Gordon Parks, where Emma Watson, a cleaning lady for the FSA in Washington DC, was photographed with cleaner and broom in American Gothic manner. Parks’ picture was directed against racial discrimination and shows the gothic of the District of Columbia. 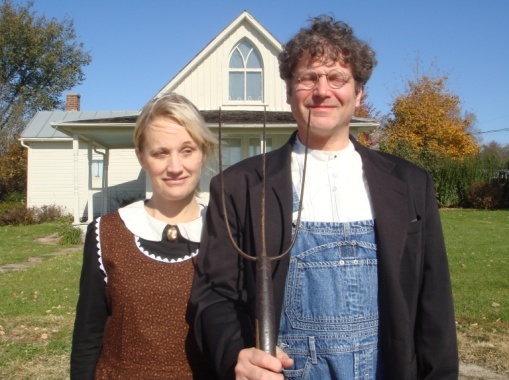 Wood has created a new destination for tourists; many people take a picture with the pitchfork in front of his house. Grant Wood was influenced by his Paris life, and made a society of the Midwest painters opposing the dominant east coast style of the art. In addition, many individuals produced creative parodies of the composition. 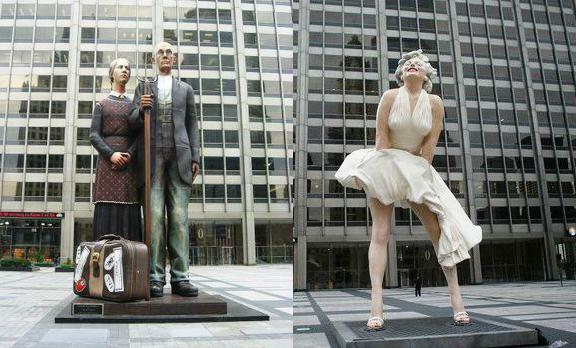 On Michigan Avenue in Chicago, the city government dedicated a statue to the masterpiece; Art lovers could have seen the original picture in Chicago Institute of Arts and then check the “live” example at the street. But you could see all this before February of 2010. Today the conservative family has been replaced by Marilyn Monroe, shamelessly waving her dress on the family’s path. “I had to go to France to appreciate Iowa.” – said Grant Wood once. To reply and summarize my post I will admit that I had to go to Minnesota to appreciate America”.